Search the newest Historic Eastside, Santa Fe homes for sale below! Find your dream Santa Fe home today! The rich, layered story of Santa Fe's Historic Eastside is told today through the range of spectacular properties that display the dynamic mix of Spanish Colonial and Pueblo architectural influences, celebrated and replicated here and throughout the world as Santa Fe style. Keep reading to learn more about Historic Eastside real estate in Santa Fe or browse our listings below! To schedule a viewing, simply contact us today. Don't forget to register with us to receive instant access to exclusive listings. You can save your favorite listings and we'll notify you when a property that meets your search criteria becomes available! It's the Santa Fe style that completely defines the character and soul of the Historic Eastside real estate market. It arose in prominence immediately following the long and difficult struggle for statehood in 1912. New Mexican's efforts to look American by importing a tapestry of architectural styles from the east coast, with modern construction techniques and materials, were threating to change the unique character of Santa Fe. The movement to implement and keep the Santa Fe style alive has kept the city different, specifically the Historic Eastside as one of the most unique real estate markets in the world. That's because Historic Eastside homes are rooted in what is considered by many as the cultural epicenter of Santa Fe - a trip back to an era before the idea of conventional America was conceived where brash Spanish Colonial settlers forged new lives amidst the indigenous pueblo people that had made Santa Fe their home for generations. Santa Fe style has maintained the Historic Eastside as the cultural epicenter of the city - a trip back to an era before the idea of conventional America was conceived where brash Spanish Colonial settlers forged new lives amidst the indigenuous pueblo people that had made Santa Fe their home for generations. From rustic adobe compounds with their vigas, latillas, nichos, canales and bancos to grand territorial estates that feature stucco exteriors with sharp parapet walls and brick coping decor, Santa Fe's Historic Eastside real estate offers a variety of living styles. These styles are reflective of the vibrant fabric of indigenous peoples, Colonial Spanish settlers, Mexican officials, pioneers, cowboys, outlaws, scientists, artists and dreamers that have graced this neighborhood and helped define Santa Fe as "The City Different." As Santa Fe's leading independent real estate brokerage, our associate brokers' local expertise in helping clients buy and sell in the Historic Eastside comes from the fact that many live their as well. 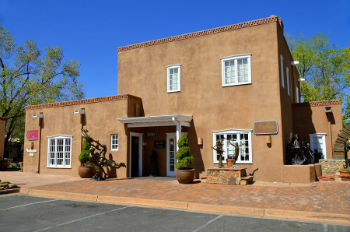 We look forward showing you properties in this amazing part of Santa Fe. Don't wait any longer to start your Historic Eastside real estate search. Contact us today to get started or simply call us at (505) 982-4466.